Image captured from ABS-CBN Sports video on YouTube. Iain Ramsay's winning goal. That scintillating 3-2 victory of the Philippine Azkals over the much higher ranked DPR Korea has been called by some as miraculous. While I totally understand the exuberance brought on by Iain Ramsay’s added time winner, I believe that the victory was as much due to the Philippines’ improved form as it was to the Koreans’ own shortcomings. Much of the Koreans’ repute was deservedly earned by two previous trips to the World Cup Finals; even if, I hasten to add, these were 44 years apart. In the context of this qualifying campaign, there was that swashbuckling 4-2 home win over eventual group winners Uzbekistan in June last year. But having seen them huffing and puffing on the way to a 1-nil win over Yemen on the same day we were putting Bahrain to the sword, I felt that the Koreans had one vital shortcoming. They had speed. They had physicality. They had the ability to retain possession. But even the humble Yemenis managed to expose their one glaring flaw: they are not clinical in front of goal. They scored four, one might argue, against the Uzbeks at the Kim Il-Sung Stadium last June. Yes they did! They scored early against a decidedly cold and disoriented Uzbekistan who were playing their opening qualifier. All their goals were scored in a blitzkrieg of a first half. In the second half, the Uzbeks had recovered their wits and pulled two back. The Koreans’ officially recorded goals for tally is 14 for an average of 1.75 per match. In fact, they were awarded a 3-nil win on the grounds of a technicality against Yemen. Without the gift of two goals, their average would have dropped to 1.5. There was arguably even a foul against Neil Etheridge before their second goal last Tuesday. Had it been called, their average would have dropped to 1.375. Contrast this to the Uzbeks’ 2.5 per game average, albeit admittedly inflated by our bad day at the office last September at the Philippine Sports Stadium. But that is what the game is all about: taking chances when they come. The Philippine Azkals thanking the fans. The Philippines’ improved form – and particularly at the defensive end – was anchored in the last two matches on the brilliance of Neil Etheridge, doubtless benefiting from regular first team football in England. Our slump in form late last year, it can also be argued, was due as much to the vast continental mileage accumulated by our team as the matches coinciding with the wrong end of the UFL season. And if we are all being honest, before World Cup qualifying started, we would all have been happy with fourth place and an automatic seeding into the third round of Asian Cup qualifying. I mean, did anybody really think we would pip Uzbekistan or DPR Korea to move into the next round of World Cup qualifying? Perhaps, had we started with a draw and grown into the tournament, our fortunes could have been vastly different. Instead, we exploded in Bahrain’s faces in that first match at the Philippine Sports Stadium and followed that win with an even more impressive victory away to Yemen. So by the next match, regrettably against Uzbekistan, expectations had skyrocketed unfairly high. I have no doubt whatsoever that the experience gained from this campaign will serve the team in good stead when qualifying for the World Cup in Qatar begins. For the meantime, our improved form in the last two matches was also likely due to the fact that expectations had finally fallen into the right perspective. In other words, the team was not as weighed down as it was late last year. Image captured from ABS-CBN Sports video on YouTube. 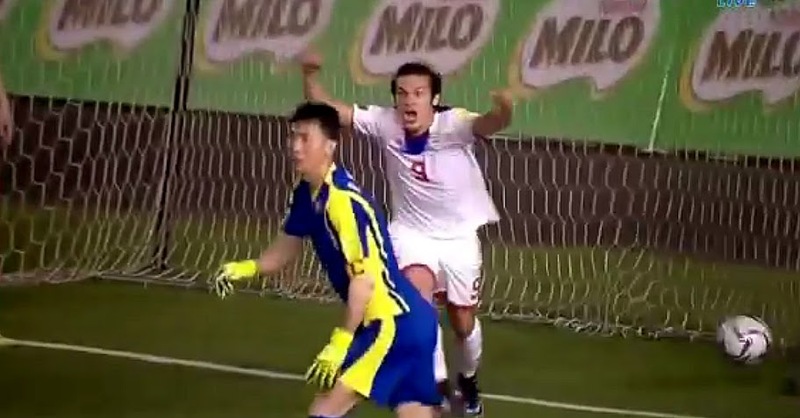 Misagh Bahadoran after the opening goal. Back to the DPR Korea match, Thomas Dooley got his tactics right placing the fleet-footed Misagh Bahadoran at the tip of the attack and having Javier Patiño dropping down to link up from midfield. The Koreans’ defensive line was almost suicidally high; and while Bahadoran was probably black and blue in places after the match from all the manhandling he received from the defenders, he also successfully worked their legs and even managed to open scoring for the Philippines. Bahadoran looked exhausted when he was substituted, but crucially the Korean defenders were also heavy-legged in the end game. 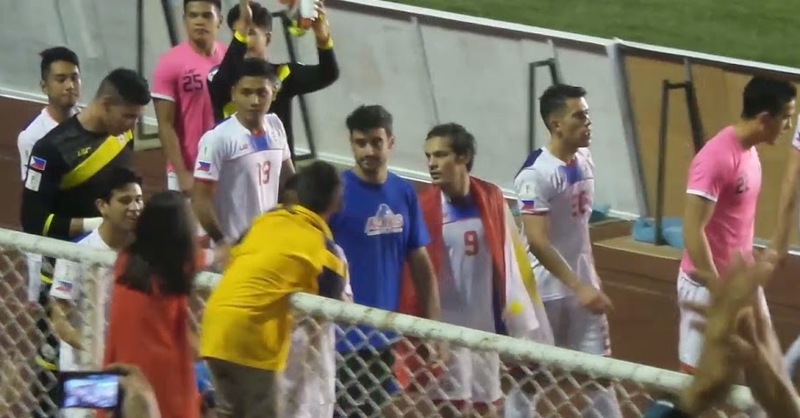 James Younghusband, returning from international exile to take Bahadoran’s place, completely changed the complexion of the game. He had looked a shade heavy at the time he was dropped from the international team, but returned looking trim and sharp. With him on the field, the Philippines relied less on over-the-top balls and instead strung passes along the floor to eventually unlock the Koreans. Manny Ott’s goal, and he was brilliant all game long, was just reward for the team’s enterprise in the final ten minutes. But even that was quickly forgotten just six minutes later when the brilliant Patiño served up Ramsay’s winner on a silver platter. Up in the stands, given the way the Philippines were continuing to pile forward after Ott’s equaliser, there was a sense of anticipation that a winner was not at all unlikely. When Ramsey’s shot hit the back of the net, Rizal Memorial erupted with unbridled joy, something all in football hope will rekindle interest in the game the way the miracle in Hanoi did in 2010. Except that this was less of a miracle and more about a Philippine team that exploited its opponents’ weaknesses, implemented the right tactics, did not allow heads to drop after two deflating goals conceded, worked hard until the final whistle and, above all, never stopped believing.